Queens slipped to a second consecutive home league defeat as they were beaten by two goals to nil in this afternoons Championship clash with St. Mirren. After falling behind early on, Queens fell further behind on the half an hour, and even though they `huffed and puffed` their way through the remainder of the game, in truth, they never looked like finding a way back into the contest. Following defeat against Rangers in their last game, Queens made just one change to the team that began against the Ibrox side, with young striker, Aidan Smith starting a home game for the first time replacing Alex Harris, and with Queens appealing against Derek Lyle`s red card, it meant that Queens top scorer was free to start his 201st game for the club, while new signing, Gary Oliver began on the bench. 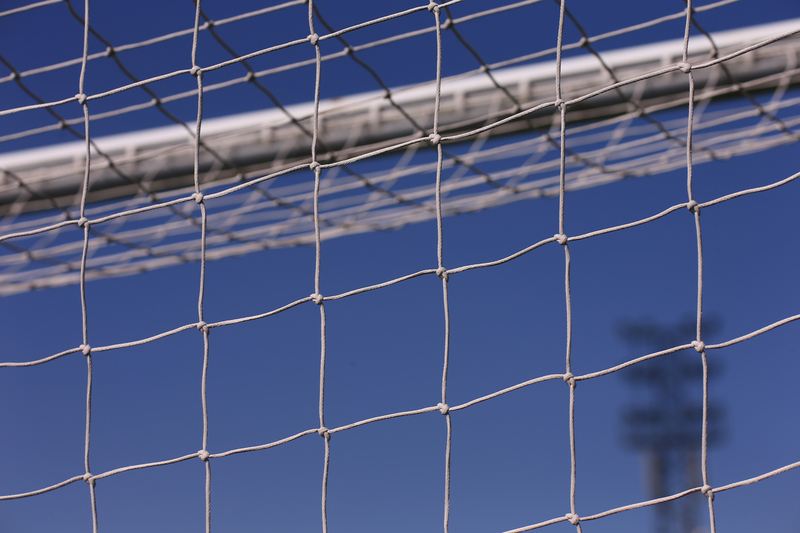 The first league game between the teams at Palmerston since Boxing Day 2005 began with the visitors applying the early pressure and after just 7 minutes following the game`s first corner kick, they opened the scoring. Mallan`s delivery was knocked down by Webster and Kelly pounced to sweep the ball beyond `keeper Thomson and a static home defence. Boosted by their confident start, the Paisley side went very close to adding to their lead some five minutes later. Agnew picked out the run of Thompson and the veteran striker turned well inside the area to send a shot towards the far post but Robbie Thomson reacted well to block the shot away. Queens were struggling with the pace of both McMullan, and Gallagher, and with Agnew and Goodwin controlling the midfield the visitors were well on top in the early stages. Ryan Conroy, who began on the left, swapped wings with Iain Russell as Queens tried to get a foothold in the game, and in one of the few decent moves of the half for Queens, Higgins, Conroy and then Marshall linked well before the move finally broke down when Marshall`s pass back to Conroy was too short. Almost immediately afterwards, St. Mirren scored again and the goal was a disaster for the Queens defence. A loose ball was sent high into the air from midfield by Goodwin and what seemed to be an easy ball to defend caused confusion between Thomson and Andy Dowie, and when Thompson got the better of the Queens defender he was able to slide the ball into the open goal as the Queens defence began their inquisitions. That second goal came after 29 minutes, and things almost got even worse for the home side five minutes before the break when following a free-kick driven in by Agnew, Thompson was only inches away from connecting with the cross as once again the Queens defence were caught ball watching. It had been a difficult first home start for young Aidan Smith, but it was his header after 41 minutes that served to be the home side`s only meaningful attempt in on goal in what was a pretty uncomfortable watch for the home support in the crowd of 2001. On the stroke of half-time Queens won their first corner of the game, and from it, the visitors almost added to their lead. Mark Millar`s poor corner eventually found it`s way to Kelly and his run and pass sent McMullan racing through on goal and although he slipped the ball past the onrushing Thomson, the pace of the ball wasn`t enough to carry it over the line and Jacobs recovered with time to spare to clear the ball to safety. A more than decent half for the visitors, who should possibly have been more than just two goals ahead at the interval. Unfortunately for Queens the second half began much the same way as the first half had ended with the visitors pressing forward and looking for more goals. Kyle Jacobs was caught in possession and once again Queens were under pressure of their own making. Agnew`s delightful through ball found Gallagher but thankfully Robbie Thomson had his angles correct and made a good save to deny the visitors a third goal. Queens responded well, and for the first time in the game, they at last put the visiting defence under some sustained pressure. Millar and Conroy linked up well down the left, and when Conroy broke into the area he tried to pick out a pass for the supporting Smith, that pass was blocked though but the ball broke back to Smith who lifted the ball over `keeper Langfield, but a covering defender cleared the ball for a corner. The corner caused a certain amount of uncertainty in the Saints defence, but luck was on their side when the loose ball deflected off of a Queens player and ran away for a goal-kick. As Queens continued to have the better of it, Lyle`s cross into the area was cleared out as far as Jacobs on the edge of the area, but with little to aim at, he dragged his first time effort wide of the target. 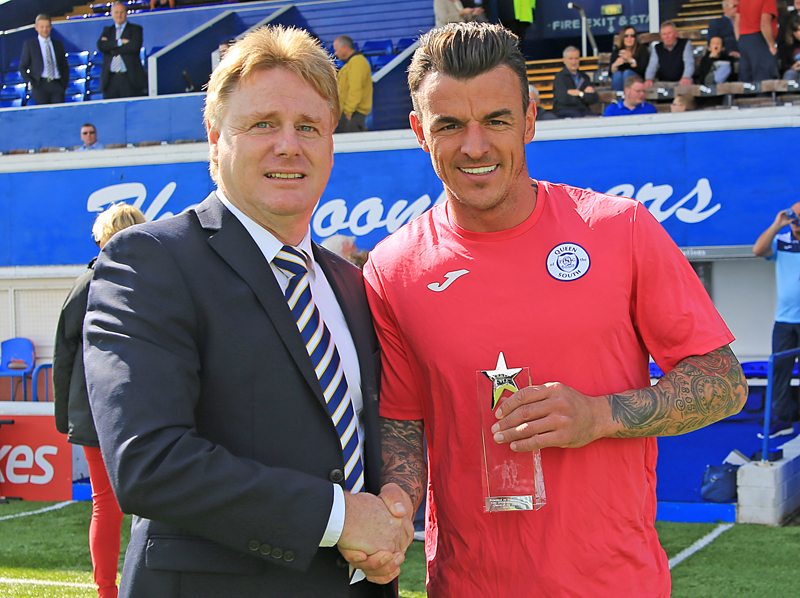 Derek Lyle`s 200th start for Queens had been somewhat frustrating for, and he became the first player to be cautioned after complaining about St.Mirren`s time wasting at re-starts, and ironically less than two minutes later, the visitors Watson was then yellow carded for time wasting at a throw-in. Queens attacked moments later and as Conroy picked out Lyle on the left with a well flighted pass, the striker was able to hook the ball back into the 6-yard area, but Langfield was quick off his line to claim the ball just ahead of Smith. Young Smith was soon involved again as this time his cross from the right took a deflection off of the head of Baird, but the ricochet was kind to St. Mirren as the ball flew into the gloves of the `keeper. There then followed a flurry of both bookings and substitutions as the game became very bitty, with Queens struggling to find a way back into contention, and the visitors happy to play the ball around at leisure. Jacobs was booked for a clumsy challenge on Kelly, and then Goodwin saw yellow for deliberate handball as the referee became the busiest man on the park. Gallagher then shot straight at Thomson as the Saints looked to add to their tally, and on 70 minutes the home fans got their first glimpse of new striker Gary Oliver as he replaced Ryan Conroy. 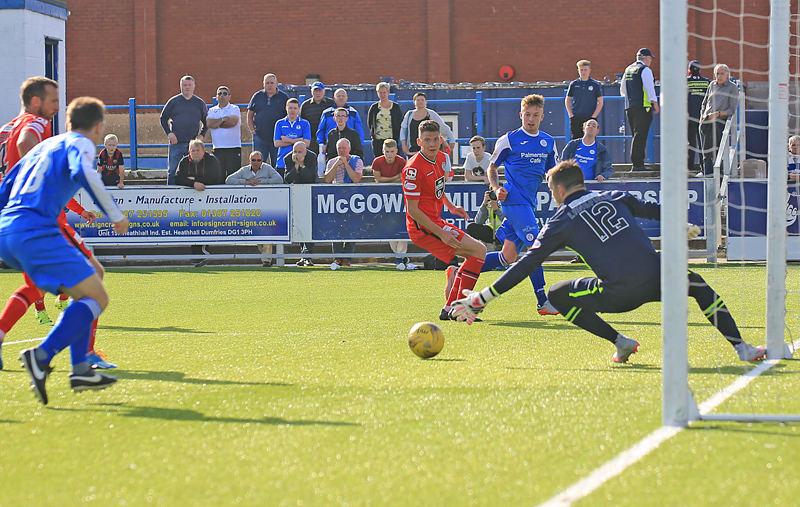 With the game moving towards it`s closing stages, Queens play became a bit more direct and a deep cross into the box from Brownlie picked out Lyle but the tightly marked striker could not keep his header on target. At the other end, Goodwin`s drive from 20-yards needed turning around the post by Thomson as a flowing St. Mirren move almost paid dividends, and once the following corner had been repelled, more poor defending from Queens allowed Gallagher a run and shot at goal, this time his effort from the right flew only just wide of the far upright. 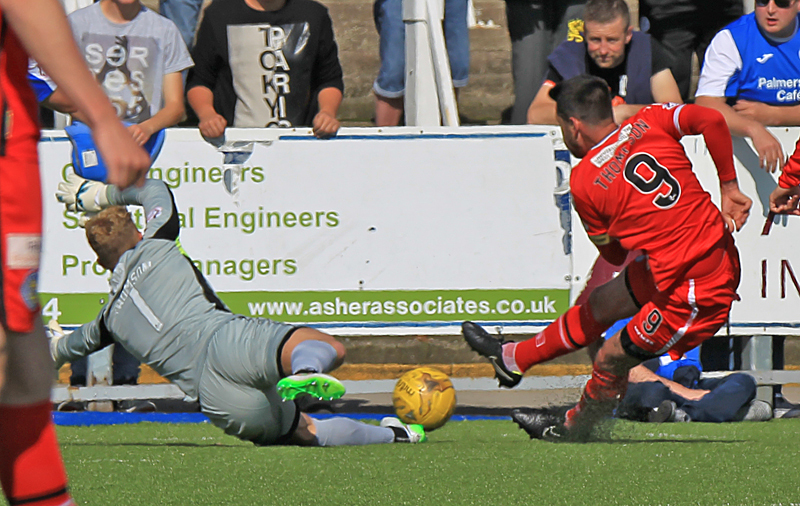 Queens made a second change with 9 minutes to go when Paul Heffernan replaced Darren Brownlie as the hosts once again played out the final stages of a game with four strikers on the pitch. It was difficult for Oliver to show much in just 20 minutes, but the former Hearts player showed some very good touches, and his low cross almost picked out Heffernan but Langfield pounced on the ball to make a comfortable save. Jordan Marshall became the third Queens player to be booked as his challenge on Mallan was deemed to be illegal. Young Owen Moxon replaced Mark Millar for the final few minutes and it was the youngster who had the last attempt of the game for Queens, but his shot from the edge of the area was always going wide of Langfield`s goal. St. Mirren sub,Lewis Morgan, won the award for quickest booking of the game, being cautioned for diving just 90 seconds after coming on. It was a comfortable afternoon for the visitors for the majority of the game as another disappointing result for Queens saw them slip to a fourth successive defeat at home,whilst opponents St. Mirren picked up their first league win of the season to move out of the bottom two. 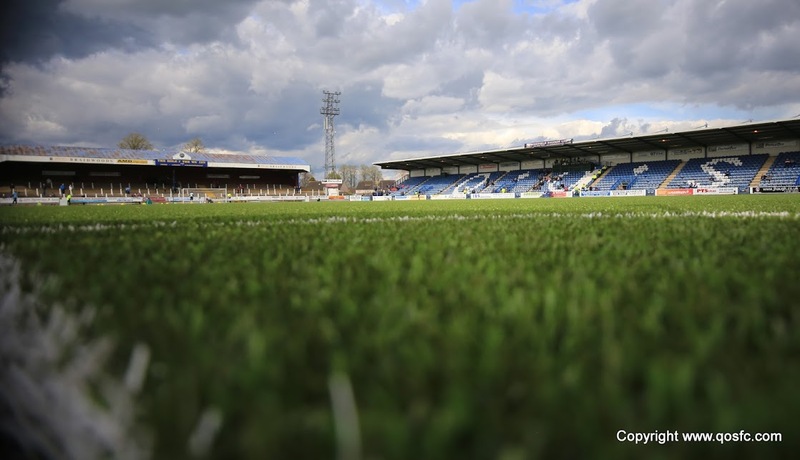 14:06 Welcome to Palmerston for today`s game against St Mirren. 14:07 We`d like to apologise again for the lack of updates last week. Hopefully we won`t have the same technical issues today.